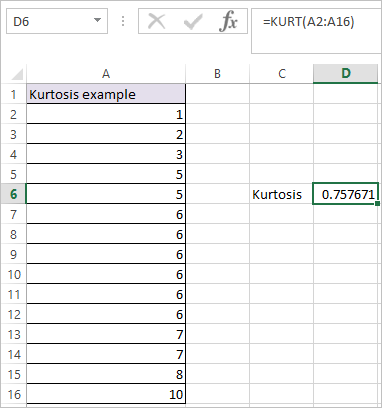 KURT Function in Excel calculates the Kurtosis of supplied sets of values. The kurtosis is a measure of the peaked ness of the distribution of the data, relative to the normal distribution. Where number arguments are the values for which you want to calculate the kurtosis for. Column A has an array of data. The kurtosis of this data can be calculated using the Excel Kurt function. As shown in the above example. This result in the value of 0.757671, which indicates relatively high peaked ness. #DIV/0! – Occurs if the supplied data set has less than 4 data points.